Ballymena United kept their title hopes alive on Saturday with a 4-1 victory over Ards at the Showgrounds. The Sky Blues are now three points off the top of the Danske Bank Premiership table but league leaders Linfield have a game in hand as they face Glentoran on Monday night. Two goals from Adam Lecky, one from Cathair Friel and an own goal sealed the points for David Jeffrey's side while Ards only goal came from Darren Henderson. Ards to their credit battled hard and hit the United woodwork on two occasions but they need to start winning games soon if they are to avoid relegation at the end of the season. In the fourth minute is was 1-0 to United. Steven McCullough found Lecky. He laid if off to James Knowles who had his effort blocked but Friel was on hand to hammer it home past Samuel Johnston. It was Friel's 15th goal of the season and Ards manager Colin Nixon will be disappointed with the start his side had made to the game. Three minutes later is was nearly 2-0 as Andy McGrory's free-kick flew just past the Ards goal with keeper Johnston looking on. It was 2-0 in the 15th minute. The ball was pushed through the Ards defence for Lecky to round the keeper and slide the ball into the empty goal. In the 18th minute it could have been 2-1. A corner found Darren Henderson and his effort hit the crossbar before flying clear as Nixon punched the air in frustration. United had the ball in the net again in the 26th minute but the flag was up for off-side after Lecky knocked it home. On 28 minutes Ards had a chance from a free-kick. Captain Callum Byers connected with a header that went straight at United keeper Ross Glendinning. Then in added time in the first half it was 2-1 as Michael Kerr's free-kick was headed home by former United player Darren Henderson and the visitors got the goal they needed just before the break. It was 3-1 to United two minutes into the second half as Lecky got his second of the afternoon after good work by Friel and Jonathan Addis and Ards now had a mountain to climb if they wanted to get something from the game. United's Kofi Balmer then went down in the Ards box and the Sky Blues bench and players thought he had been struck off the ball but the referee waved play on. Friel then had another chance in the 65th as Winchester fed Lecky. He touched it on for Friel but his shot was well saved by keeper Johnston in the Ards goal. Ards had a great chance in the 71st minute as Mark Kelly's effort beat keeper Glendinning but crashed back off the bar. United's Friel had another effort in the 76th minute but his effort was blocked on the line by a defender with keeper Johnston stranded. It was 4-1 in the 80th minute. A McCullough free-kick found the head of Ards defender Michael Kerr and it was game over. 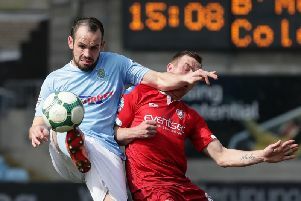 Ballymena United: Glendinning, Addis, Friel (McMurray 83mins), Knowles (Harpur 75mins), McCullough, McGrory, Balmer, Winchester (Kane 83mins), Ervin,Lecky, Millar. Subs not used: Williamson, Whiteside, Faulkner, Shevlin. Ards: Johnston, Kerr, E McAllister (Bennett 61mins), Byers, Cherry, D McAllister, J Kelly, Tommons (M Kelly 51mins), Nelson, Evans, Henderson (McLellan 73mins). Subs not used: Davidson,, McClean, McAleenan, McCawl.